(NaturalNews) Cinnamon has so many uses. For most people, it's a condiment for milk or oatmeal or is used in potpourri. The best thing about cinnamon is that it's easily available everywhere. Do you know that cinnamon has numerous health benefits? Do you know where it comes from? Considering their health benefits, some might think it comes straight from heaven! Cinnamon is actually a bark of a specific type of tree that belongs to one family of trees. So, there's no such thing as plain cinnamon, as there are so many types of cinnamon available on the market! The different types of cinnamon come from different parts of Asia. About 90 percent of the world's cinnamon comes from Southern India and Sri Lanka, while other areas ranging from Madagascar toVietnam and China produce the remaining 10 percent. Cassia is a highly popular form of cinnamon in the US. It is also termed "Chinese cinnamon," but "true cinnamon" comes only from Sri Lanka. This cinnamon has a more "high end" and delicate taste than what we've been using in the US. The presence of cinnamaldehyde an (essential/volatile) oil in cinnamon helps it in reducing blood clots. According to WHfoods.com, cinnamon accomplishes this by inhibiting the release of arachidonic acid from various platelet membranes, which is an inflammatory fatty acid that reduces the formation of the inflammatory messaging molecule known as thromboxane A2. The essential oils in cinnamon are antimicrobial and can stop various types of bacterial and fungal growths. The antimicrobial properties of cinnamon are very effective, so it can also be used as an alternative to various food preservatives. Cinnamon has a high fiber content and is also a good source of calcium and manganese. Fiber and calcium combine to help in removing bile salts from the body. This helps in protecting the colon and also reduces the risk of colon cancer. This also helps in reducing the cholesterol levels, thereby reducing chances of heart disease. High fiber content in cinnamon also provides relief from diarrhea or constipation. Cinnamon is a very powerful antioxidant and also helps in controlling blood sugar at various levels. This helps in slowing down the rate at which the stomach empties after meals and improving the insulin response in people suffering from type 2 diabetes. Cinnamon is so effective that just one gram of it a day can reduce blood sugar levels, LDL cholesterol, triglycerides and total cholesterol in people suffering from diabetes. 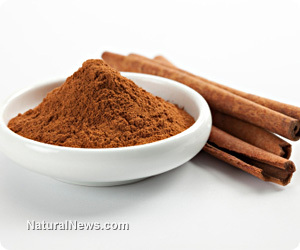 According to WHfoods.com, cinnamon also reduces risk of cardiovascular diseases in people with type 2 diabetes. Cinnamon is best for providing warmth to the body during a flu or cold. In fact, it is widely used in traditional Chinese medicine due to its warming properties.